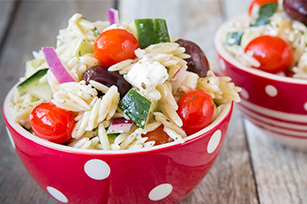 Make a creative pasta salad with our Greek Orzo Salad recipe! Cucumbers, olives and crumbled feta help give Greek Orzo Salad its Greek-style appeal. In a large saucepan, bring 4-6 quarts of water to a boil over medium high heat. Add orzo and boil, stirring occasionally, for 10 minutes. Immediately drain into a colander and rinse with cold water, tossing gently to cool and prevent clumping. Transfer to a large mixing bowl and set aside. In a GOOD SEASONS cruet or a container with tight fitting lid, combine GOOD SEASONS Greek Dressing Mix, oil, vinegar and water. Shake vigorously until well combined. Top cooled orzo with cucumber, tomatoes, olives onion, feta and prepared Greek dressing. Toss gently to evenly distribute all ingredients and chill until ready to serve.